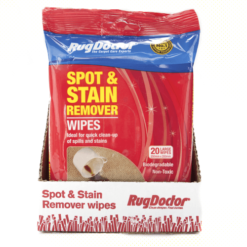 Rug Doctor Pro Odour Remover works with or without a Rug Doctor Pro cleaning machine. 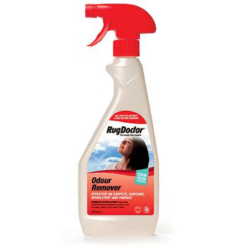 Rug Doctor Pro Odour Remover’s special enzymatic action attacks foul odours at their source. 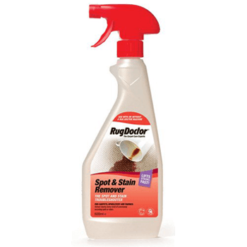 Rug Doctor Pro Odour Remover works with or without a Rug Doctor Pro cleaning machine. Its special enzymatic action attacks foul odours at their source. 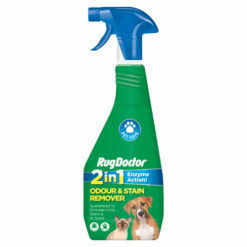 mildew, smoke, food and drink spills, pet accidents, vomit, perspiration and more. Uses enzymatic process to kill the bacteria that causes the odour. 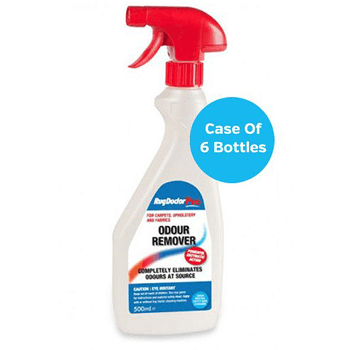 Deodorises carpet and upholstery . Available in a 500ml trigger spray. 1. Remove any solid matter from treatment area. 4. Clean following machine instructions. 3. Apply full-strength by pouring, mopping or spraying solution on problem area. 4. Do not blot or wipe – enzymes need moisture to work. Place a damp, colour-safe towel over the treated area and let it dry naturally. In most cases it’s best to allow the area to remain moist for 24 hours. Highly contaminated areas may require a second application. 5. Once dry, if discolouration remains, simply dampen with water and blot. All Rug Doctor Pro chemicals have the safety data information printed on the back or the reverse label for your convenience – please click on the link below if you would like to download a digital copy of this as well. Before using: Test for colour-fastness with properly diluted solution in an inconspicuous area. Wait 10 seconds then blot with a white cloth to check for colour transfer. CAUTION: Harmful if swallowed. Do not inhale. Eye and Skin irritant. Keep out of the reach of children. Deal with common everyday household spills and stains. Free your home from stubborn stains including food, drink and grease marks. Rug Doctor Pro Traffic Lane Cleaner is a powerful pre-cleaning agent. It’s specially formulated to break the bonds of embedded dirt and grease from areas of heavy foot traffic such as kitchens, hallways and doorways. Rug Doctor Pro Urine Eliminator is an ideal solution for urine, vomit and faeces stains and odours.